Leading Manufacturer of pu seals and polyurethane wheels from Ahmedabad. 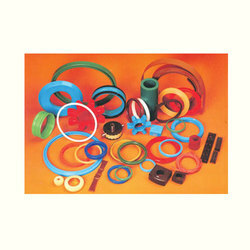 We are engaged in offering a range of polyurethane products that includes PU Seals. These are drafted and refined using latest technology and superior quality raw material. Our product is appreciated for durability, chemical & abrasion resistance and flexibility. Our seals are light in weight and high in performance. We can also customize your assortment as per the specific requirements of shapes and designs provided by our clients. Looking for Polyurethane Seals ?